Hitoshi Ariga wrote and drew a Mega Man manga in the late 90s that has recently been republished in the states as Mega Man MegaMix. I remember reading a bit of volume 2 and feeling disappointed. However, I felt obligated to try and read it since it came before Mega Man Gigamix. 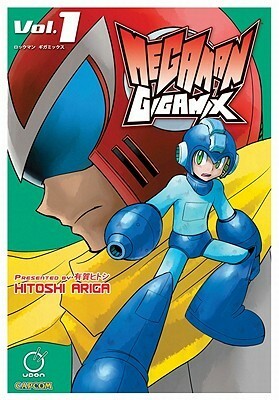 Until I didn't.Mega Man Gigamix is the re-release of a Mega Man manga that Hitoshi Ariga wrote in the late 2000s and was just re-released in time for Mega Man's 25th anniversary. You can really see a lot of improvement in Ariga's writing and art over those 10 years and I'm getting closer to the Mega Man stories I want to read. This volume contains two stories.Asteroid Blues was AMAZING and dealt with an incarcerated Dr. Wily and the return of the problematic Proto Man. Ariga did well to capture the complexity of Proto Man, a character I think is way under-utilized in the series.Break and Chase was less amazing, but I realize now that it is meant to tie in to an actual Mega Man game called Break and Chase which is a racing game. While this story was based largely on novelty, the core of the plot is actually well constructed and suspenseful. By the end, I enjoyed it more than I thought I would but it still did not top Asteroid Blues.However, I am completely looking forward to Volume 2!!! I am not sure why this is called Gigamix, as this is basically a continuation of the story already established in the three Megamix books. You get the Robot Bosses of Megaman 7 (borrowing a few other things from the game as well) and a cool bonus story that serves as a sort of inbetweenquel to earlier Mega Man games. The artwork for Gigamix is as solid, so if you have the Megamix books, definitely buy this because you can see this as Megamix Vol. 4. The first half was a more serious story which took part in space and involved many of the MM3 master robots, and it was really exciting. I also liked the second half, which was a bit more humorous, and made me laugh out loud multiple times. I really liked it!